“Productive civic engagement requires knowledge of the history, principles, and foundations of our American democracy, and the ability to participate in civic and democratic processes. People demonstrate civic engagement when they address public problems individually and collaboratively and when they maintain, strengthen, and improve communities and societies. Thus, civics is, in part, the study of how people participate in governing society” (NCSS 2013, 31). The Center for Civics Education (@CivicEducation) was one of fifteen organizations that collaborated on the College, Career, and Civic Life (C3) Framework for Social Studies State Standards (NCSS 2013). According to their website, “The Center is dedicated to promoting an enlightened and responsible citizenry committed to democratic principles and actively engaged in the practice of democracy in the United States and other countries” (http://www.civiced.org/about/37). The Center started in 1965 at the University of Southern California. Researchers have conducted studies related to all five of the projects hosted on this website. The Center’s “Promoting the Principles and Practice of Democracy” video is a worthwhile introduction to their work. Educators who are preparing to connect curriculum with #Election2018 will want to explore the resources available on their site. The site offers five programs. I have reviewed “We the People” and “Project Citizen” below. The “School Violence Prevention Demonstration Program” provides professional development support for educators who are teaching the “We the People” and “Project Citizen” programs in their classrooms. The James Madison Legacy Project is focused on educator professional development, and Civitas International involves learners in countries around the world. This program offers textbooks that include six units of study at three instructional levels: upper elementary, middle, and high school. You can download a two-page summary of the program. If your school or district has adopted these texts or is considering a new social studies/civics adoption, these resources may be important to your classroom-library collaboration. “We the People” videos offer an overview of the program and its impact on student learning. This civic education program, geared to middle, secondary, and post-secondary students and youth or adult groups, offers open education resources. The goal of Project Citizen is to promote “competent and responsible participation in state, local, and federal government.” The site offers lessons/units of instruction. The Level 1 lessons are for students in grades 5-8. Level 2 lessons are for secondary and post-secondary students. Lessons are aligned with the Common Core Standards in History/Social Studies. For example, the four lessons in the “9/11 and the Constitution” unit involve students in reflecting on U.S. ideals and answering the question: “What does it mean to be an American?” The subsequent lessons involve students in learning from various founding documents and completing a questionnaire about how well our country is actualizing these ideals. Students also administer the questionnaire to adults in their homes and communities. The unit concludes with students comparing and discussing the similarities and differences in people’s responses. Finally, students compose an individual or small group statement and cite evidence on how well the American government is fulfilling its purposes as set forth in the Preamble. As with all published lesson plans and units of study, educators will want to adapt instruction for their students and the context in which the lessons are presented. For #Election2018, students could make connections by examining local, state, and national candidates’ statements to analyze them for “U.S. ideals” as expressed in the Preamble of the Constitution or other governmental documents. 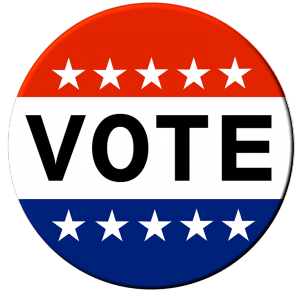 They could also examine the prior voting records and statements made by incumbent candidates and determine whether or not the candidates’ statements and actions are consistent. 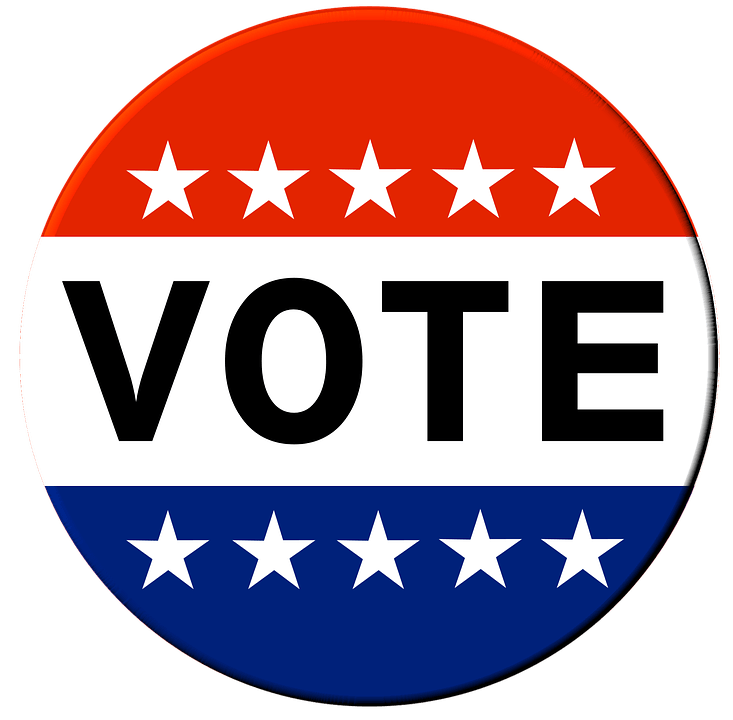 Students could then debate the merits of various candidates using the evidence they found in the candidates’ campaign materials and/or voting records. Another component of the site involves learners in working together as a class or extracurricular group to identify and study a particular public policy issue. The final product of this project-based learning opportunity is a portfolio that may be presented to other students, civic groups or community organizations, or policymakers. Both the Center for Civics Education and the Stanford History Education Group (reviewed last week) have resources to offer educators who are building students’ background knowledge, information-seeking and critical thinking skills in order to connect school-based curriculum with #Election2018. If I were in charge of this holiday, all U.S. students be would studying the Reverend Dr. Martin Luther King, Jr.’s legacy of social justice. They would be reading, discussing, marching, or otherwise working in their communities to bring about positive change. Students and classroom teachers would also have access to diverse library collections – and most especially school library collections – that provide students with books and resources that represent the diversity of human experience. Since most librarians do not have the opportunity to actually read the print resources they select before they purchase them, they must rely on published book reviews. This means that children’s and young adult book reviewers are mediators between readers and their literature. During the month of December, I had the pleasure of interviewing Mary Margaret Mercado, Pima County Public Library children’s librarian who reviews children’s and young adult literature for two well-known review sources. Mary Margaret and I are advocates for diversity and live in a community where Latinx students and families are the majority in the largest school district. We walk and talk most weekend mornings and have often shared our concerns and frustrations with the content, quality, and quantity of books that reflect Latinx culture. 1. Who are the author, illustrator, and/or translator? 2. What are their backgrounds? 3. Who was the original publisher? 1. From whose perspective is the text written? 2. Are characters, plot, and setting authentic, or are stereotypes presented? 3. What do the review sources say, and how have cultural “insiders” responded to this text? 1. How does the illustrator’s background or research influence the visual elements in this book? 2. What meanings are communicated through the images? 3. Do the visual elements authentically and accurately portray cultural information? 1. What kind of first-hand experience or research informs the text? 2. What current or historical factors shape the story or information in the text? 3. How are current or historical power relations reflected in the text? We posted once each week in December on the WOW Currents blog. The links below lead to each week’s post. With each link, I have shared a comment and my biggest takeaway(s) or remaining question(s) from that week’s post. In the introductory post on December 4, 2017, Mary Margaret shared her background, how she got started as a children’s literature book reviewer, and her reviewing process. In reading this post, you will note that it was from giving a book review editor critical feedback on a particular review that resulted in Mary Margaret being invited to review for that source. She answered a call for reviewers for the other source for which she reviews. For the most part, Mary Margaret reviews children’s picturebooks and Spanish language or Spanish/English bilingual books. She constructs book reviews in three parts: 1. the story or information, 2. illustrations for visual incongruities or strengths, and 3. cultural components of the book with her recommendation. She believes it’s her job to “to find any negative, inauthentic or inaccurate elements and point them out in (her) review.” Mary Margaret’s cultural insider knowledge for Mexican themed books gives her a distinct advantage when reviewing Latinx themed books. 1. When librarians read book reviews, do we notice whether or not cultural information is included in the review? 2. Do we consider or question the reviewer’s knowledge in terms of assessing cultural authenticity in the work? In this post, Mary Margaret provides one very clear example of a book in which the author’s and illustrator’s cultural knowledge (or research) was lacking. In her review, she justified her “not recommended” rating with specifics from the story and the illustrations. She also shared information about the importance of language and translation in relationship to authenticity. 3. Is the story setting authentic? Since Mary Margaret’s responses to authenticity in story were comprehensive, we decided to carry over the conversation about picturebook illustrations to week four (and did not have the opportunity to explore sociopolitical and historical authenticity on the WOW Currents blog). This post about authenticity in illustration is packed with information that cultural outsiders may find especially illuminating. Since many errors in illustration are not caught by art editors, it seems that librarians will want to consult cultural insiders about authenticity in picturebook visuals. For many that may be after the fact of purchase. Still, books published with errors can be used in classroom-library lessons as examples for what not to do. Mary Margaret identified several author-illustrators whose work is culturally authentic and shows congruity between story and illustration. Adriana M. Garcia, illustrator of Xelena González’s book All Around Us (Cinco Puntos, 2017). The story honors traditions while steeped in a contemporary setting. Yuyi Morales’s magical realism illustrations are perfectly aligned with Laura Lacámara’s story Floating on Mama’s Song (Katherine Tegen Books, 2010). Duncan Tonatiuh’s Mixtex illustration style provides the perfect blend of contemporary and historical elements in Salsa: Un poema para docinar/Salsa: A Cooking Poem by Jorge Argueta (Groundwood, 2015). And please mark your calendars. On Tuesday, January 23rd at 1:00 p.m. Central, AASL and Scholastic Books are offering a free, one-hour webinar titled: Mirror, Mirror, Who Do You See in Your Books? Reaching Diverse Readers. Read about it and consider arranging your schedule so you can participate. Botelho, Maria José, and Masha Kabakow Rudman. 2009. Critical Multicultural Analysis of Children’s Literature: Mirrors, Windows, and Doors. New York: Routledge. The mission of the Worlds of Words (WOW) is “to build bridges across global cultures through children’s and adolescent literature.” WOW hosts a physical library collection of international children’s and young adult literature on the campus of the University of Arizona in Tucson. In addition, WOW’s online presence includes book reviews (WOW Review), articles about integrating global literature into the classroom and library (WOW Stories), the WOW Currents blog, My Take/Your Take Book Dialogues, and an Author’s Corner. This month on the My Take/Your Take Book Dialogues, Deborah Dimmett from the University of Arizona and I are sharing global children’s literature picture books that portray or could inspire social activism. Our list of books is at the end of this post. In their book For a Better World: Reading and Writing for Social Action (Heinemann, 2001), Randy and Katherine Bomer note that the ways an educator uses literature, designs activities, and prompts questions are part of a classroom (or library) discourse. When educators share their values and read texts that continually and consistently focus on values, students can naturally and openly discuss values as well. Our first post this month is focused on the book In A Cloud of Dust (Fullerton/Deines). I wrote the introduction to the book and responded. Deb then wrote her response to the book. It is clear to me that Deborah and I will provide examples this month that demonstrate the nature of readers’ responses. As Louise Rosenblatt’s transactional theory (1978) attests, each reader brings her own feelings, personality, and experiences to the reading of a text. Our responses to and interpretations of these texts will be different based on our background knowledge, values, and beliefs as well as the literal content of the text and the authors’ intentions. Engaging in these types of discussions—whether in the face-to-face or online environment—can help educators prepare to share these texts with students. These five books provide jumping off places for students and teachers to engage in critical conversations. We invite you to check on our discussions and contribute your responses, interpretations, and comments this month. Bomer, Randy and Katherine Bomer. 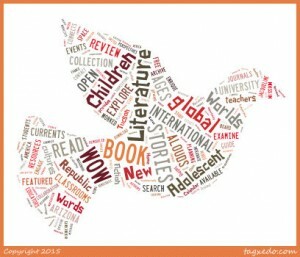 For a Better World: Reading and Writing for Social Action. Portsmouth, NH: Heinemann, 2001. Print. Rosenblatt, Louise M. The Reader, the Text, the Poem: The Transactional Theory of the Literary Work. Carbondale, IL: Southern Illinois University, 1978. Print. This month the BACC co-bloggers will share different aspects of diversity and inclusion as applied to and practiced in school librarianship. “Culturally responsive collection development” is a term and strategy school librarians apply to indicate that we build library collections that reflect and support the cultural backgrounds of our students. To build on this strategy, we must also consider that we are living in a global society that extends beyond our students’ personal and family cultures to a wider and more diverse world. In order to ensure that multiple voices and perspectives are represented in the resources the library provides for students, classroom teachers, and families, school librarians can develop a collection that includes global literature. Global literature includes books set in non-U.S. cultures, or is written by immigrants about living in the U.S. or in their home countries, or is written by authors who live and work in the U.S. and another country. These resources can help readers connect with others who live within and beyond our country’s borders. Susan Corapi, Worlds of Words (WOW) board member, and Kathy G. Short WOW director, recently released a downloadable .pdf file booklet, Exploring International and Intercultural Understanding through Global Literature, to help educators understand and learn more about using global literature to explore international and intercultural understanding. 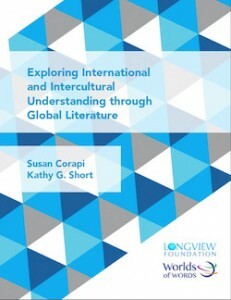 In this work, Susan and Kathy provide information about a Longview Foundation for International Affairs grant-funded project called “Global Literacy Communities.” The book includes the experiences of twenty-five pre-kindergarten to high school educator study groups from nineteen U.S. states that met regularly for a period of one to three years to learn through global literature. In their study groups, educators used global literature to further develop their international understanding and strove for something more—intercultural understanding. As Susan and Kathy note, “Intercultural understanding extends beyond nationality and politics to include informed problem solving and social action activities that necessitate an appreciation of the full range of issues, including the values and beliefs of everyone involved. Intercultural understanding creates the potential to move from curiosity about a culture to a deeper understanding of others that allows us to live and work together as global citizens” (4). BACC readers can access an article about this publication on the EdWeek blog and can learn more about the study groups by reading articles published in the online journal WOW Stories. When we practice culturally responsive collection development, we have the potential to impact curriculum. But we can guarantee that impact by coplanning and coteaching to use those resources for the benefit of all students. When we take students’ heritage languages and home cultures into account and use them as background knowledge in lesson design, we are maximizing opportunities to use resources to impact student learning. In doing so, school librarians combine our skills at collection development with “connection development” (Lankes). As collaborating school librarians, I believe we cannot overestimate our importance as literacy stewards in our buildings. With our knowledge of literature, technology resources, tools, and devices we can support teachers’ teaching and help motivate students to engage deep and meaningful learning. As the “Global Literacy Communities” study groups attest, we develop our own international and intercultural understanding as we work alongside students and classroom teachers. How are you using global literature in your library program? Have you cotaught a collaborative lesson or unit or participated in study group to bring a global focus to your teaching? On Thursday, I will share WOW’s My Take/Your Take Book Dialogues as a model for engaging in virtual discussions with other educators centered on global literature. Corapi, Susan, and Kathy G. Short. Exploring International and Intercultural Understanding through Global Literature. Longview Foundation: Worlds of Words. 2015. Web. 30 Nov. 2015. <http://wowlit.org/Documents/InterculturalUnderstanding.pdf>. Lankes, R. David. The Atlas of New Librarianship. Cambridge, MA: MIT Press, 2011. Print. The school librarian who is looking for professional development reading titles to add to his or her summer list has a plethora of books to choose from: titles written by other educators, fellow school librarians and leaders in the field. We may not always consider memoirs or even fiction as reading for professional development. However, titles in this genre can serve as amazing professional development resources. Let me give you a few examples. 1. This summer, my husband and his brother – both of whom are teaching in rural areas in South Georgia – decided to form a mini book club. They are reading The Ecology of a Cracker Childhood by Janisse Ray. If you are interested in this title, the New York Times wrote a detailed review. The reason both Green boys decided to read this title is because it is a memoir written by an author that grew up in the same area (and under similar circumstances) as many of their students. By reading titles such as these, they hope to develop a deeper understanding and knowledge of their students’ background, cultural history, and experiences. Hopefully, this understanding will lead to deeper connections between themselves and their students, and will aid them in teaching their respective subjects in ways that relate better to their kids. 2. When I was 12 years old, my family immigrated to the United States. As many first generation immigrants will tell you, it was a challenging and difficult experience. Sadly, I made the mistake of assuming that my own immigration experience equipped me to understand and relate to the immigration experience of my students in West Texas. It was a mistake that cost me several student and teacher connections. Eventually, I read Esperanza Rising by Pam Munoz Ryan and When Zachary Beaver Came to Town by Kimberly Willis Holt. Reading these two different stories really helped me to see how immigrating from Mexico to work as a migrant worker in West Texas was a unique experience for my students. It helped me to learn to listen to them more openly, without attempting to layer my own preconceived ideas on top of their stories. It was a beneficial and humbling lesson that helped me become a better school librarian. 3. Local and Independent Book Stores (if you are lucky to have one near you, these often maintain close relationships with local authors and can give you great recommendations). I’m not sure about you, but it has been *cough, cough* several years since I completed a degree in education and obtained teacher certification. Most of us in the education profession realize that to remain effective and relevant, we must constantly update our skills and keep up with the movements and trends affecting our practice. But sometimes, these trends are cyclical. We see an educational approach or method repackaged or rebranded for a new generation of students. My father is fond of exclaiming “There is nothing new under the sun!” and many times I am inclined to believe he is right. When I first heard the terms: “differentiated instruction,” these brought to mind some of the ideas we have discussed in the field of instructional design for quite some time. 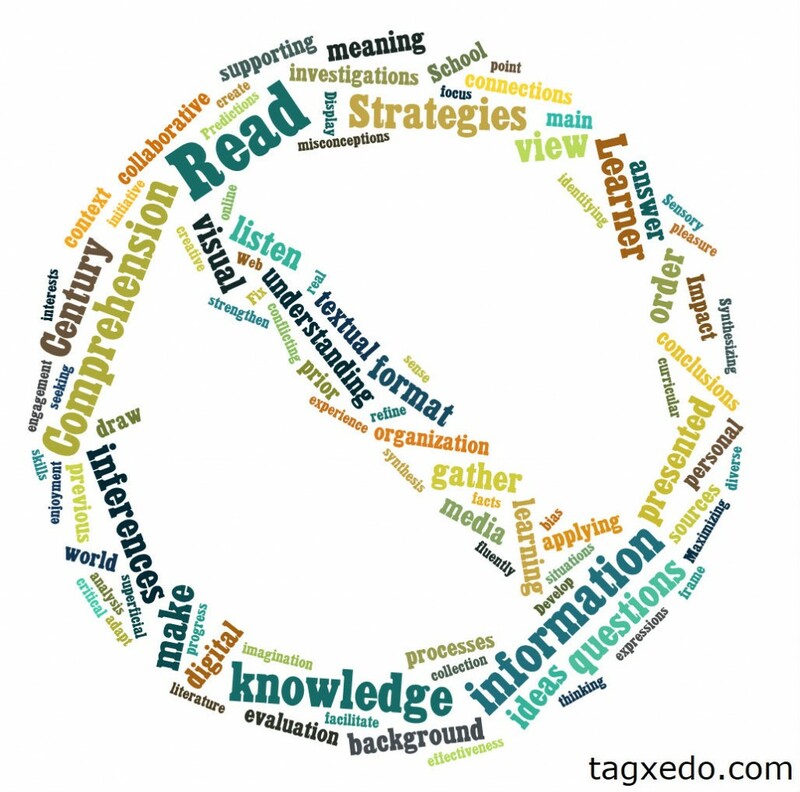 Ideas like learner analysis (who are my learners? what do they know? what are their learning struggles? where do they need support?) and content analysis (what am I teaching? What are the key ideas, concepts? What is the best order to introduce these concepts?) were some of the most obvious and immediate connections. Even so, recognizing “differentiated instruction” as containing approaches we find familiar, and actually enacting and supporting this practice as school librarians are vastly different situations. If we are to collaborate with teachers and support learning for all, then we need to be able to verbalize differentiated instruction, recognize what it looks like, plan for it, and support its implementation. Differentiated instruction is “a way of thinking, an approach to teaching and learning that advocates beginning where students are and designing experiences that will better help them achieve” (Koechlin & Zwaan, 2008, p. 2). When you read through those four conduits, did your eyes light up with recognition? Did you think to yourself: “I do design these four elements differently depending on student needs! I differentiate!” If so, then congratulations! However, if you are struggling a bit to envision how you might have a role impacting these four elements when you are not the classroom teacher, then I encourage you to set aside fifteen minutes this week and read Everyone Wins: Differentiation in the School Library by Carol Koechlin and Sandi Zwaan. In this article, Carol and Sandi list concrete examples of ways you can implement, as well as support differentiated instruction in your school. As the authors state: “connecting kids and content in meaningful ways is the work of all educators, and helping every child achieve is our mutual goal” (p. 2). This month the BACC co-bloggers will share thoughts and examples of the school librarian’s role in differentiating instruction so that all learners have opportunities to succeed. 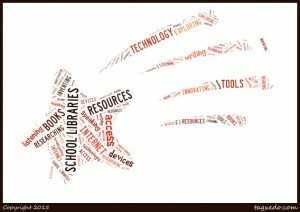 This word cloud image encapsulates many keywords associated with learning through the school library program. The work that school librarians do in their schools is always interdisciplinary and supports students in making connections to crystallize their learning. English language arts learning objectives related to reading, writing, listening, and/or speaking are part of every lesson we coteach. We collaborate with educators teaching various grade levels and all content areas. The learners we work with have a wide range of background knowledge and are at various measures of proficiency for any skill or strategy we set out to coteach. How does the library environment support the differentiation that students need to succeed? I have had this experience more times than I can count. After introducing an online pathfinder of electronic resources, high school students quietly call me over to whisper in my ear, “Isn’t there a book about this?” Classroom teachers are often surprised by such student requests; I am not. With the print and electronic resources of the library and the Internet, school librarians develop expertise at integrating resources in multiple genres and formats into students’ learning opportunities. Of course, classroom book collections offer some range of resources, but the library collection’s range is far wider. School librarians develop print collections at the widest possible range of reading proficiencies on topics that cover all areas of the curriculum. School librarians’ ability to connect the “just right” resources to meet each learner’s needs is one of the strengths, in terms of differentiation, that we bring to the classroom-library instructional partnerships. Rosenwald, Michael S. “Why digital natives prefer reading in print: yes, you read that right.” Washington Post.com. 22 Feb. 2015. Web. 02 Mar. 2015 >http://www.washingtonpost.com/local/why-digital-natives-prefer-reading-in-print-yes-you-read-that-right/2015/02/22/8596ca86-b871-11e4-9423-f3d0a1ec335c_story.html>. Are you a member? 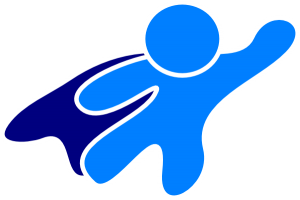 Do you have your flashing cape and shiny literacy toolbox ready to come to the aid of your local classroom teachers and learners? What’s in your toolbox to help teachers personalize literacy for all their learners? Resources for literacy should not be an either/or choice for investing in schoolwide literacy programs. In some schools, classroom collections are funded at the expense of school library collections. In some schools there is zero, or limited budget for both, so classroom teachers and teacher librarians are scrambling to find donations or write grants to provide needed materials for students. Some school rely on textbook programs. Some schools have robust resources for classrooms and libraries. What’s it like at your school? In order to address the individual challenges of each school, literacy leadership teams should represent a cross section of educators in a school. The teacher librarian needs to be at the table and on the team. Classroom collections are an important resource for literacy instruction. School library collections provide a breadth of materials in multiple formats that extend and support reader choice for information and enjoyment in and beyond the classroom. A selection of current and relevant resources chosen by a knowledgeable teacher librarian, benefits all the members of the school community, and provides a great return on investment. Both of these resource collections are important components of a dynamic and nimble literacy program. Teachers and teacher librarians are natural partners for the literacy team. Working with classroom teachers in the classroom as co-teachers, or in the library space, teacher librarians have opportunities to guide emerging, developing, or passionate readers and writers to discover literacy as a joy, not a chore in life. What do you bring to the literacy table? Book clubs for students, and invite teachers, parents, or community members to take part. Choose themes or genres to begin, and then let others do the choosing and leading. Extend literacy lessons for the classroom into the library. For those on a fixed schedule, coordinate with the classroom teacher around themes, genres, or skills. Or flip it-introduce them in the library classroom and send selections back to the classroom. Listen to the concerns and challenges of classroom teachers, and be ready to problem solve solutions to help them transform literacy learning in the classroom and the whole school. These are just a few of the ideas that I have tried with success, and I’m sure you have many more. 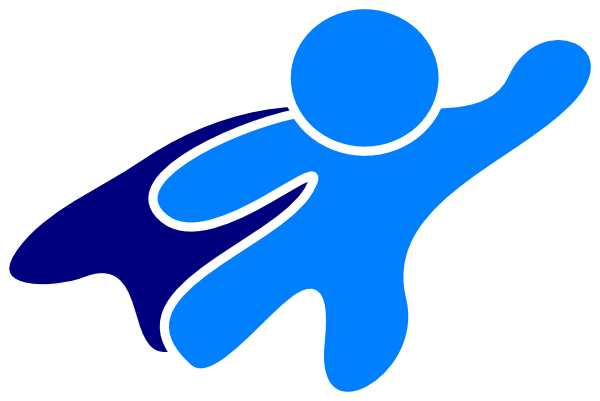 So grab your cape and toolbox and join the team! Miller, Donalyn. The Book Whisperer. San Francisco, CA: Jossey-Bass, 2009. print. Miller, Donalyn and Susan Kelley. Reading in the Wild. San Francisco, CA: Jossey-Bass, 2013. 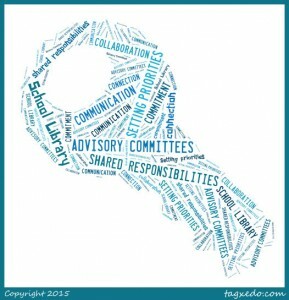 What are the keys to an effective school library advisory committee? I propose these: Communication-Connection-Commitment-Collaboration. If classroom teachers have not had positive input into school library collection decision-making, then they may refer to the library collection as the property of the librarian. When a classroom teacher tells students to be careful with “Ms. Jones’s books” (the librarian’s books), the wise school librarian will make it clear that the library collection belongs to all of the library stakeholders: students, teachers, administrators, and families. Once collective ownership is established, the librarian can invite classroom teacher colleagues to join the school library advisory committee in order to participate in decision-making regarding library purchases and initiatives, such as grant writing and literacy events. The wise school librarian will ensure that the resources of the library are aligned with the curricular needs of classroom teachers and students. While the Common Core State Standards may make this a library goal in many states, the school library has always been charged with providing resources and technology tools to support teaching and learning the required curriculum. In most schools, the school library advisory committee will meet during before or after school hours. It will be important for the school librarian to honor the extra commitment it will take for classroom teachers to participate in developing the library collection as a shared resource for the school community. Likewise, the school librarian’s commitment to shared decision-making must be genuine and clear to all advisory committee members. One of the most outstanding benefits of a library advisory committee is increased collaborative teaching between classroom teachers and school librarians. When advisory committee members have shared responsibility for selecting resources, they will have a shared commitment to using those resources for standards-based instruction. While classroom-library collaboration ensures that valuable resources will be integrated into instruction, it can also improve educators’ teaching and students’ learning. 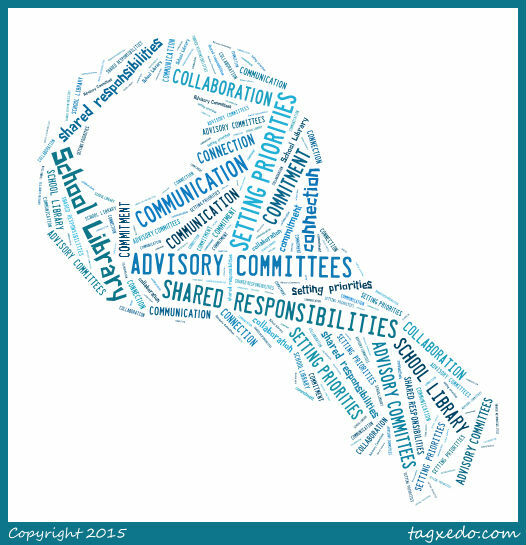 School library advisory committees that achieve the four keys, communication-connection-commitment-collaboration = win-win-win-win for all library stakeholders. 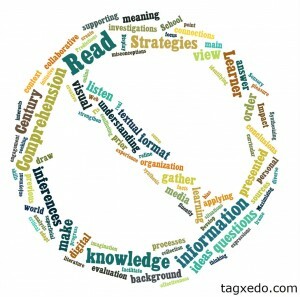 The BACC bloggers are experimenting with exploring a shared topic each month. We will share various perspectives and points of view. This month we are looking at school libraries as compared with classroom libraries and book rooms and the impact of leveled reading on library resources. Overarching question: If a school librarian’s goal is to strengthen her/his relationships with classroom-bound teachers, what roles might the library collection play in supporting teachers’ teaching and students’ learning? Providing students with “trending extras” such as makerspace and coding opportunities does not capture the most meaningful contributions school libraries make to learning and teaching. These two examples should not be restricted to the library environment and would be most effective if integrated into a total-school program. School libraries that are open for after school hours have always provided students with access to whatever resources they need; this is not new and should not be news. In my opinion, school libraries first and foremost contribute resources and the expertise of the school librarian (not necessarily in that order). While library resources and school librarians’ skills have changed, these contributions have been consistent — at least for the quarter of a century I have been involved in school librarianship. According to literacy educator Frank Serafini, at least 100 books per child should be the goal for a well-stocked classroom library and recommends that classroom libraries contain 2,500 – 3,000 books in all genres and at all reading levels (37). While I applaud classroom teachers that write grants, raise funds, and use their own financial resources to provide students with classroom libraries, my experience tells me that a classroom collection cannot compare with a well-developed and managed library collection. A school librarian who aligns the library collection with the curriculum and provides independent reading selections for students can provide a wider selection of books and resources in all genres and more support for readers at all reading levels. Involving classroom teachers in reviewing, recommending, and purchasing resources for the library is one way for the school librarian to strengthen her/his relationships with classroom teachers. This can be done formally with a Library Advisory Committee or informally with individual teachers and grade-level teams. Serafini, Frank. Around the Reading Workshop in 180 Days: A Month-by-Month Guide to Effective Instruction. Portsmouth, NH: Heinemann, 2006.